Fish production projected at over 3.5 lakh tonnes this year, against two lakh tonnes last year with net income of Rs 500 crore. PUSH FOR SELF SUFFICIENCY: The State government allocated Rs 1,000 crore for integrated fisheries development project, including supply of fish seedlings free of cost. Hyderabad: Chief Minister K Chandrashekhar Rao’s attempt to promote pisciculture and fishing to empower fishermen communities is showing signs of success with officials estimating more than 50 per cent growth in fish production since the launch of the scheme last year. Though there were initial hiccups affecting release of fish seedlings in tanks and reservoirs, officials are attending to these issues at regular intervals and enabling the fishermen community to reap the benefits. To provide livelihood and increase the income of Mudhiraj and Bestha communities, the State government launched the scheme and supplied fish seedlings to the Fishermen Cooperative Societies free of cost to release them into water bodies such as village tanks and reservoirs. Under the Fisheries Development Scheme, the government decided to supply 70 crore seedlings comprising varieties such as Korrameenu, Ravva, Botcha and Mose. While 27.9 crore fish fingerlings were distributed last year, around 45 crore fishlings have been released so far this year. The State government allocated Rs 1,000 crore for integrated fisheries development project, including supply of fish seedlings free of cost. Fish production in the State was projected at over 3.5 lakh tonnes this year, against two lakh tonnes last year with net income of Rs 500 crore. S Saidulu, a member of Fishermen Cooperative Society at Peddadevulapally in Nalgonda district, said the daily income of fishermen in their cooperative society increased after the government took the initiative to release fish seedlings into the tanks. “Earlier, we worked under contractors who bid for tanks and paid us for fishing based on fish weight. Now, we are earning more than Rs 500 per day fishing and selling it ourselves,” he said. Last year, the erstwhile Nalgonda district recorded fish production of 8,856 tonnes resulting in the business of more than Rs 50 crore. The Chief Minister has been repeatedly stating that potential of fisheries was high in Telangana and has been pressing for an integrated approach to increase production. “Once Kaleshwaram and Palamuru Lift Irrigation schemes are completed, the State would have enormous scope for development of fisheries and its export to other land-locked States,” he said recently. Further, the Chief Minister’s brainchild Mission Kakatiya had not only helped the revival of tanks and kuntas but also facilitated pisciculture. Minister for Animal Husbandry, Fisheries and Dairy Development Talasani Srinivas Yadav stated that due to the initiatives of the State government for revival of the rural economy, the socio-economic status of Backward Classes in Telangana had undergone a sea change. “Rural development has undergone a change for the best under the present government. Families that were once struggling now have the government’s support and are financially stable because of the various initiatives the State government has taken for the welfare of various sections of society, including the BCs,” he said. After succeeding in increasing its fish production, Telangana is now attempting to promote shrimp cultivation in reservoirs of the State. A pilot project has been taken up in six reservoirs where the State government released around 1.5 crore shrimp seed over a three-month period. 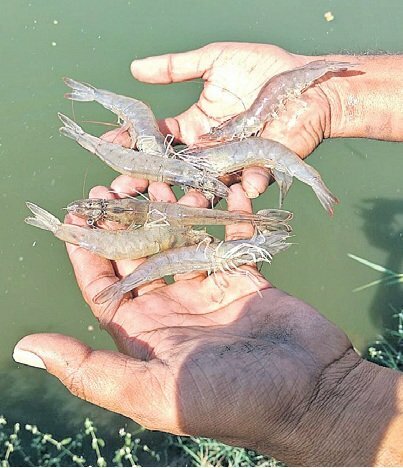 The Scampi variety of shrimp will be cultivated in six reservoirs in the State on a pilot basis at Lower Manair Dam in Karimnagar district, Singur reservoir in Sangareddy district, Koil Sagar in Mahabubnagar, Kadem reservoir in Nirmal district, Ghanapur (Mulug) reservoir in Jayashankar Bhupalpally district and Wyra reservoir in Khammam district. 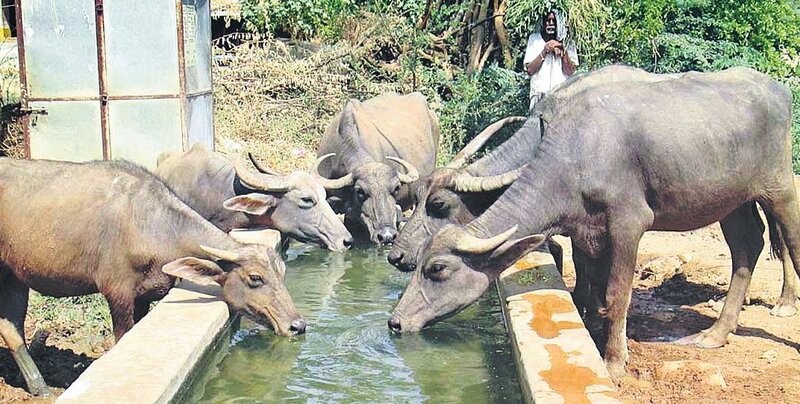 With the objective of bringing in a White Revolution in the State, the Chief Minister announced his plans to distribute a buffalo each to around two lakh dairy farmers at a subsidised rate of 50 per cent. About 75 per cent subsidy will be provided in the case of SC/ST dairy farmers. Each buffalo costs about Rs 50,000-Rs 60,000 in the cattle market. The new cattle distribution scheme will be implemented on the lines of the sheep distribution scheme where dairy farmers can purchase a buffalo of their choice with the help of five cooperative dairies in which they are members. Funds will be released to the respective dairy development societies within a month and chairpersons of the dairy societies of Karimnagar, Mulkanoor, Nizamabad, Nalgonda and Ranga Reddy will oversee the implementation of the scheme, which will start within two months. Under Haritha Haram programme, the Chief Minister gave a clarion call to villagers of Keshavaram and Laxmapur in Medchal district to plant six saplings in each household and promised to supply the saplings on behalf of the government. He also promised to provide them two cattle after they ensure the survival of all six plants for about a year. Interestingly, the call received a tremendous response in urban areas with people inquiring with officials about the supply of saplings to plant in their households. Plans are afoot to implement the scheme across the State. To support caste-based professions in Telangana and put the State in top meat exporting States list, the State government decided to support pig rearers by distributing pig units at a subsidised rate by framing guidelines on the lines of sheep distribution scheme. Though the scheme is still in the pipeline, the State government had already issued instructions to traditional pig rearers to form co-operative societies to enable the State government to distribute pigs at a subsidised price besides supplying fodder. The government would also facilitate these pig rearers to export the meat. There is a great demand for pig meat in North Eastern States, Tamil Nadu and Kerala, while Uttar Pradesh, West Bengal, Karnataka, Bihar and Jharkhand are some of the largest pig meat suppliers in the country. The scheme is expected to help livelihood of pig rearers from communities such as Waddera and Yerukala besides some tribes.